To understand this page, read about liberties and eye liberties first. Not much discussion here, but I'll use it as the base. Each case builds on from the previous case. Anyway, a two-space eye has 2 liberties. Bill Spight: Under either form of scoring, it is costly for Black to reply unless necessary, except after the dame stage. In that case it is costly under territory scoring but not under area scoring. We are back to a two-space eye. 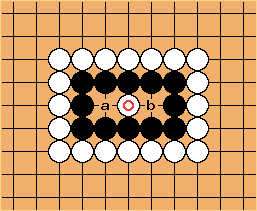 Note that after playing the marked stone, Black has two liberties (the same as the two-space big eye, since White a is answered by b, so that liberty doesn't count). 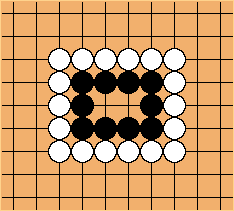 Thus a three-space eye has 1 + 2 = 3 liberties. 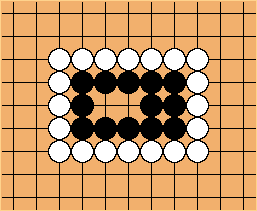 1 for the first movement (white marked stone) and then 2 to fill the two-space eye remaining. The discussion on liberties of eyes is continued on big eye liberties.